The leaky Lamb wave (LLW) technique is approaching a maturity level that is making it an attractive quantitative NDE tool for composites and bonded joints. Since it was first observed in 1982, the phenomenon has been studied extensively, particularly in composite materials. 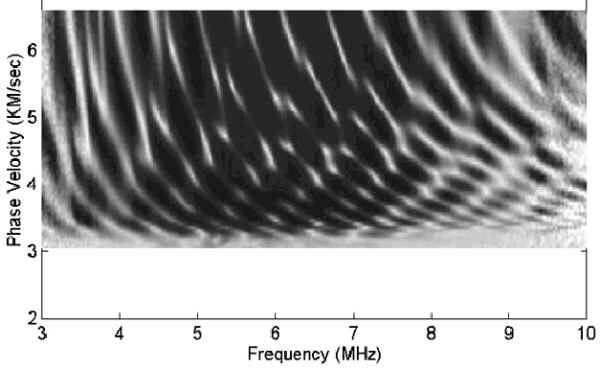 The leaky wave is induced by oblique insonification using a pitch-catch arrangement, and the resulting modes are acquired by identifying minima in the reflected spectra. These modes are recorded in the form of dispersion curves, which are evaluated in relation to analytical data. The wave behavior in multiorientation laminates has been well documented and corroborated experimentally with high accuracy. The sensitivity of the wave to the elastic constants of layered materials and to boundary conditions enables the measurement of the elastic properties of bonded joints. Recently, the authors significantly enhanced the LLW data acquisition experimental capability, significantly increasing the acquisition speed as well as the number of modes that can be identified. This capability greatly increased the accuracy of the data inversion, improved the characterization of flaws and the practicality of the technique. Despite progress in the theoretical and experimental aspects, methods based on the oblique insonification of composites are still not used routinely in industrial applications. The authors investigated the possible causes that are hampering the transition of the LLW to industrial applications and identified 4 key issues. The recent experimental development and the issues affecting the transition of the technique to practical use are described in this paper. Defect Detection and Characterization: Throughout their life cycle composites are susceptible to the formation of many possible defects primarily due to their multiple step production process, their non-homogeneous nature and brittle matrix. These defects include delaminations, matrix cracking, fiber fracture, fiber pullout, inclusions, voids, and impactdamage. Table 1 shows some of the defects that may appear in composite laminates and their effect on the structural performance. While the emphasis of most practical NDE is on2 detection of delaminations, porosity and impact damage, Table 1 shows that other defects can also have critical effect on the host structures. Therefore, it is essential to be able to characterize the flaws in order to determine their degradation effect on the integrity of the structure. Delamination Catastrophic failure due to loss of interlaminar shear strength. Typical acceptance criteria require the detection of delaminations with a linear dimension larger than 6.4-mm (0.25-in). Strength loss can be predicted by assuming loss of load-carrying capability. Characterization of Material Properties : Production and service conditions can cause property degradation and sub-standard performance of primary structures. Sources for such degradation can be the use of a wrong constituent (fiber or matrix), excessive content of one of the constituents (resin rich or starved), wrong stacking order, high porosity content, microcracking, poor fiber/resin interface aging, fire damage, and excessive environmental/chemical/radiation exposure. Current destructive tests using representative coupons are costly, and they do not provide direct information about the properties of the structure. Rapid Large Area Inspection : Impact damage can have critical effect on the capability of composite structures to operate in service. This critical flaw type can be induced at anytime during service life anywhere on the structure and it requires detection as soon as possible rather than waiting for the next scheduled maintenance phase. Using conventional NDE for the assurance of the structural integrity can be very expensive, and it takes the aircraft out of its main mission. Since impact damage can appear anytime and anywhere on the structure, there is a need for a low-cost system that can be used to rapidly inspect large areas in field conditions. The use of robotic crawlers can potentially offer an effective platform for rapid inspection of composite structures [Bar-Cohen and Backes, 1999]. Real-Time Health Monitoring : Structurally integrated health monitoring systems are needed to reduce the rate of periodic inspections requiring the temporal withdrawal of aircraft from service. Fundamentally, such health monitoring systems emulate biological systems where onboard sensors track structural integrity throughout the life cycle. Such systems can monitor changes in the characteristics of critical parameters and activate an alarm when certain values have been exceeded. Several concepts have been pursued in recent years, including the application of optical fibers, however no such system yet exists in service. Smart Structures : The availability of compact actuators, sensors and neural networks has made it possible to develop structures that self-monitor their integrity and use actuators to avoid or respond to threats. Changes in environments or service conditions can be counteracted by an adequate combination of actuators and sensors that change the conditions and/or dampen the threat. Sensor fusion, neural networks and other artificial intelligence capabilities may be used to quickly evoke the most effective response. An example of the application of smart structures is the reduction of vibrations that lead to fatigue damage. The data would need to be evaluated in relation to a finite element modeling analysis to determine the possible effect of the detected anomaly on the structure. Residual Stresses : Current state of the art does not provide effective means of a nondestructive determination of residual stresses in composite materials, and technology is needed to detect and relieve such residual stresses. Weathering and Corrosion Damage: Composites that are bonded to metals are sensitive to exposure to service fluids, hygrothermal condition at elevated temperatures, and corrosion. Particular concern arises when aluminum or steel alloys are in direct contact with composites that consist of graphite fibers or carbon matrix. Graphite is cathodic to aluminum and steel and therefore the metal, which is either fastened or bonded to it, is eroded. In the case of graphite/epoxy the metal deteriorates, whereas in the case of graphite/polyimide defects are induced in the composite in the forms of microcracking, resin removal, fiber/matrix interface debonding and blister (e.g. delaminations). The level of degradation of composite materials exposed to a service environment depends on the chemical structure of the polymer matrix. In thermoset composites, the epoxy absorbs moisture and loses its thermal stability as a matrix in a reversible plasticisation process. On the other hand, thermoplastics are susceptible to the effects of aircraft fluids such as cleaning fluids, paint stripping chemicals and fuel. Imide polymers are sensitive to strong base producing amid acid salts and amides, and their degradation rate is determined by such parameters as the temperature, stress, and humidity. The strength of the material deteriorates at an exponential rate, however annealing can reduce the degradation rate. Generally, NDE methods are used to determine the integrity and stiffness of composite structures. While information about the integrity and stiffness can be extracted directly from NDE measurements, strength and durability can not be measured by such methods because they are not physically measurable parameters. For many years, the multi-layered anisotropic nature of composites posed a challenge to the NDE research community. Pulse-echo and through transmission are still the leading standard NDE methods of determining the quality of composites. However, these methods provide limited and mostly qualitative information about defects and material properties. The discovery of the leaky Lamb wave (LLW) [Bar-Cohen & Chimenti, 1984] and Polar Backscattering [Bar-Cohen & Crane, 1982] phenomena in composites offered effective NDE techniques, and progress in the field enabled significant quantitative capability. These obliquely insonified ultrasonic wave techniques were studied both experimentally and analytically by numerous investigators [e.g., Mal & Bar-Cohen, 1988, Nayfeh & Chimenti, 1988, and Dayal & Kinra, 1991]. These studies led to the development of effective quantitative NDE methods for the determination of elastic properties, accurate characterization of defects and even for the determination of the quality of adhesively bonded joints [Bar-Cohen, et al, 1989]. In spite of the progress that was made both theoretically and experimentally, oblique insonification techniques have not yet become standard industrial NDE methods for composite materials. Parallel to the development of the analytical capability, jointly with Mal from UCLA [Mal, 1988], extensive efforts have been made to enhance the LLW experimental capability and the progress is reported in this manuscript. The authors investigated the possible causes that are hampering the transition of the LLW technique to practical NDE and address key issues that are associated with the experimental capability. The leaky Lamb wave (LLW) phenomenon is induced when a pitch-catch ultrasonic setup insonifies a plate-like solid immersed in fluid. This phenomenon was discovered while testing a composite laminate using Schlieren imaging system (see Figure 1) [Bar-Cohen, et al, 1993]. The phenomenon is associated with a resonant excitation of plate waves that leak waves into the coupling fluid and interfere with the specular reflection. The leaky waves modify the reflection spectrum, introducing a series of minima produced by destructive interference at specific frequencies between the leaky wave and the specular reflection. The LLW experimental procedure involves a measurement of the reflections and extraction of the dispersive spectral characteristics at various angles of incidence and at several orientations (polar angles) with the laminate fibers. The data is presented in the form of dispersion curves showing the LLW modes phase velocity (calculated from Snell's law and the angle of incidence) as a function of the frequency. Fig 1: A Schlieren image of the LLW phenomenon showing a tone-burst before (right) and after impinging on the graphite/epoxy laminate. Bar-Cohen and Chimenti  investigated the characteristics of the LLW phenomenon and its application to NDE. The investigators concentrated on the experimental documentation of observed modes and the effect of defects. Their study was followed by numerous theoretical and experimental investigations of the phenomenon [e.g., Nayfeh & Chimenti, 1988, Mal & Bar-Cohen, 1988, and Dayal & Vikram, 1991]. A method was also developed to invert the elastic properties of unidirectional composite laminates from the LLW dispersion data [Mal, 1988; and Mal & Bar-Cohen, 1988] and the study was expanded to the NDE of bonded joints [Bar-Cohen, et al, 1989]. The experimental acquisition of dispersion curves for composite materials requires accurate control of the angle of incidence/reception and the polar angle with the fibers. To perform these measurements rapidly and accurately a specially designed LLW scanner was developed by the principal author [Bar-Cohen, et al, 1993]. With the aid of a personal computer, this scanner (made by QMI, Costa Mesa, CA) controls the height, angle of incidence and polar angle of the pitch-catch setup. The LLW scanner manipulates the angle of incidence/ reception simultaneously while maintaining a pivot point on the part surface. A view of the LLW scanner installed on a C-scan unit is shown in Figure 2. A computer code was written to control the incidence and polar angles, the height of the transducers from the sample surface, and the transmitted frequency. In prior studies, the data acquisition involved the use of sequentially transmitted tone-bursts at single frequencies over a selected frequency range (within the 20dB level of the transducer pair). The reflected signals are acquired as a function of the polar and incidence angle and are saved in a file for analysis and comparison with the theoretical predictions. The minima in the acquired reflection spectra represent the LLW modes and are used to determine the dispersion curves (phase velocity as a function of frequency). The incident angle is changed incrementally within the selected range and the reflection spectra are acquired. For graphite/ epoxy laminates the modes are identified for each angle of incidence in the range of 12o to 50 o allowing the use of free-plate theoretical calculations. At each given incidence angle, the minima are identified, added to the accumulating dispersion curves, and plotted simultaneously on the computer display. While the data acquisition is in progress, the acquired minima are identified on both the reflection spectra and the dispersion curves. Fig 2: A view of the LLW scanner (bridge right side) installed on the JPL's C-scan system. A follow-on study by Bar-Cohen, et al,  showed that the capability to invert the elastic properties using LLW data is limited to the matrix-dominated stiffness constants. This limitation can be partially overcome if the incidence angle can be induced at less than 10o , but this is difficult if not impossible to achieve in a practical experiment. An alternative methodology based on pulsed ultrasonics was developed by Bar-Cohen, Mal and Lih . Using pulses in pitch-catch and pulse-echo experimental arrangements and assuming that the material is transversely isotropic and, it was shown that all five elastic constants can be determined fairly accurately. A parametric study was conducted and the expected error was determined for the various determined constants in relation to experimental errors. It was also shown that the stiffness constant, C12, that is the most sensitive to defects, is critically sensitive to alignment errors in the incident and polar angles. While the developed capability allowed measuring dispersion curves to support the analytical efforts, the process has still been slow, and there were difficulties identifying modes associated with minima that are less than about 4% below the adjacent signal. Fig 3: A schematic view of the LLW test system. Extensive studies of composites by the authors and their colleagues led to the identification of a series of deficiencies that affect inversion reliability and the transition of the technique to practical applications. Their recent efforts concentrated on the enhancement of the speed of the data acquisition and the number of modes that can be identified in a LLW experiment. A schematic view of the test system is shown at the center of Figure 3.
where fo is initial frequency and the constants k1 , k2 are the frequency parameters related to time for sampling. Fig 4: Computer display after the data acquisition and inversion completion. The elastic stiffness constants are inverted from the dispersion curve data and are presented on the left of the screen. A trigger based on the selected time frame is transmitted to synchronize the reflected signals on the data acquisition scope, and the time domain signal is converted to spectral data using the above equation. The function generator also provides a reference frequency marker for the calibration of the acquired data when converting the signal from time to frequency domain. A digital scope is used to acquire the reflection spectral data after being amplified and rectified by electronic hardware. The signals that are induced by the transmitter are received, digitized, processed and analyzed by a personal computer. The reflected spectra for each of the desired angles of incidence is displayed on the monitor, and the locationsof the minima (LLW modes) are marked by the computer on the reflection spectrum. The algorithm used to identify the minima was modified to employ reliably smaller level signals, which are associated with more diffused modes. The identified minima are accumulated on the dispersion curve, which is shown on the lower part of the display (see Figure 4). It should be noted that during the Leaky Lamb Wave (LLW) experiments, the height of the pair of transducers is an important issue. In order to obtain the best results, the crossing point of the beam from the two transducers must fall on the surface of the specimen. If this point is placed outside the surface, the contrast of the minima to the adjacent data points becomes weaker as shown in Figure 5a. In such a case, the identification of the minima becomes more difficult and increasingly inaccurate. To adjust the height of the transducers precisely and efficiently, an algorithm was developed and implemented into the computer control program of the LLW experiment. The algorithm optimizes the contrast of the minima by determining the maximum variance of the derivation of the reflection spectrum using adaptive adjustment of the transducer pair height. Using this algorithm interactively with the LLW setup controller, an optimal and fine-tuned height of the transducer pair was identified automatically, and an example is shown in Figure 5b. Fig 5a: "Out of focus" LLW reflection spectrum. 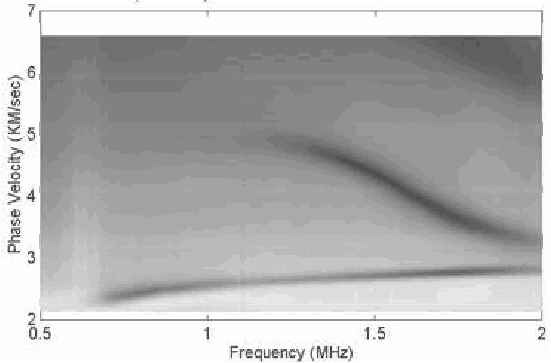 Fig 5b: Optimized reflection spectrum using adaptively adjusted transducers pair height. The use of the FM modulation and automatic optimal adjustment of the transducers' height significantly increased the speed and accuracy of acquiring LLW dispersion curves. To compare performance, 20 different angles of incidence were acquired in approximately 45 seconds as opposed to over 15-minutes using the former approach. A pre-programmed algorithm based on the Simplex inversion methodology was used to extract the stiffness constants. Once the dispersion data was acquired, the inversion option of the software was activated and the elastic stiffness constants were determined as shown in Figure 4. Typical LLW dispersion data and inverted results for a unidirectional graphite/epoxy plate are also shown in Figure 4 for AS4/3501-6 with a polar angle (i.e., the direction of Lamb wave propagation) of 0o. The reflected spectrum for 39.9o incident angle is shown at the top of this Figure, and the accumulating dispersion curves are at the bottom. The inverted elastic and stiffness constants are given at the left. Using a system with this enhanced capability, various defects can be detected and characterized rapidly based on the signature and quantitative data that is available from the dispersion curves. In Figure 6a, the response from a defect-free graphite/epoxy laminate tested at the 0-degree polar angle is shown. In Figure 6b, the response from an area with a layer of simulated porosity (microballoons) is presented. As expected, at low frequencies the porosity has a relatively small effect and the dispersion curve appears similar to the one on Figure 6a. On the other hand, as the frequency increases, the porosity layer emulates a delamination and modifies the dispersion curve to appear the same as half the thickness laminate. Fig 6a: The refection at 39.9 degrees incidence angle and the dispersion curve for a Gr/Ep 24 laminate with no defects Fig 6b: The response at a defect area where porosity was simulated at the middle layer. To demonstrate the capability of the LLW method to characterize materials degradation of composites, a sample made of AS4/3501-6 24 laminate was tested after it was subjected to heat treatment. The sample was exposed to a heat ramp from room temperature to 480o F for 15 minutes, and then was taken out of the oven to cool in open air at room temperature. The sample was tested at a specific location before and after heat treatment. The measured dispersion curves are shown in Figure 7. It can be seen that there are distinct differences in the dispersion data for the specimen before and after heat treatment. Since the heat damage occurs mostly in the matrix, the effect is expected to be more pronounced in the matrix-dominated stiffness constants. The constants c11, c12, c22, c23 and c55 obtained from the inversion process are 127.9, 6.32, 11.85, 6.92 and 7.43 GPa, before heat treatment, and 128.3, 6.35, 10.55, 6.9 and 7.71 GPa, after heat treatment. The most noticeable and significant change is in the stiffness constant c22, which is the property most sensitive to variations in the matrix resulting in a reduction in the transverse Young's modulus. To enhance the accuracy of the inversion of the material stiffness constants, a method was developed to acquire dispersion curves and display them as shown in Figure 8. In this Figure a 3.125 mm unidirectional laminate was tested in the polar angle along the fibers. This method was found to allow viewing modes with amplitude levels that are significantly smaller than ever before observed. The bright curved lines show the modes on the background of the reflected spectra. Methods of extracting the modes were investigated using image processing operators and neural network procedures. Once the curve of a specific mode is determined, it is transformed to actual frequency vs. velocity data and then inversion is applied. Using this capability, the unidirectional laminate was also tested along the 90 o polar angle. As can be seen in Figure 9 modes that would otherwise be considered noise are clearly identified. To demonstrate this capability further a 1.6 mm aluminum plate was tested in the low frequency region near the first symmetric and antisymmetric modes. 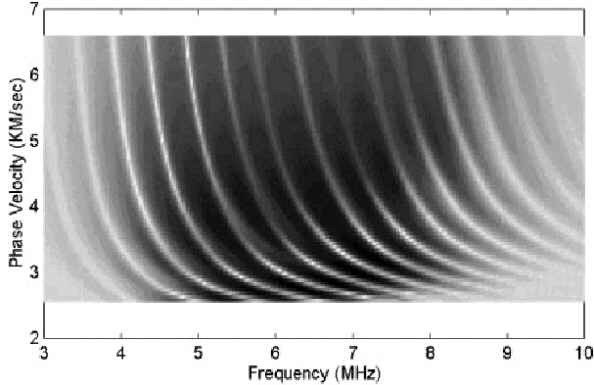 As shown in Figure 10 the portion of the mode that is almost parallel to the frequency axis is identified offering a capability that was previously very difficult when analyzing signals in the conventional single frequency method. Material density - The inverted material constants are based on the assumption that the material density is known. This assumption may not be correct, particularly in the presence of flaws. DE measurement of the material density can be done by radiographic testing. However, such tests are not economical and require access from two sides of the test structure. An alternative method of measuring the density is needed. Multi-orientation laminates - The inversion algorithm developed for the determination of the elastic properties has been very successful for unidirectional laminates. The analysis of laminates with multi-orientation layers using ply-by-ply analysis is complex and leads to illposed results. Methods of inverting the material elastic properties without the necessity to deal with individual layers are needed and are currently being explored. Complex data acquisition - The LLW data acquisition setup is complex, and the related process is not user friendly. The authors have significantly improved the data acquisition process by automating the process of aligning the height of the setup as discussed in this manuscript. Also, the polar angle is set using the polar backscattering technique [Bar-Cohen and Crane, 1982] to determine the direction of the first layer. User friendly control software operating on a Widows platform is being developed to allow interactive software control, minimizing the need for manual setup alignment. Time-consuming process - The formerly reported process of acquiring dispersion curves was time consuming, taking between 10 and 20 minutes to acquire a curve for a single point on a composite material. As reported in this manuscript, recent developments by the authors allow measuring dispersion curves at a significantly higher speed in fractions of a minute. Using this new capability, various defects can be detected and characterized based on their dispersion curve signature. Further, the increased speed of dispersion data acquisition offers the capability to produce C-scan images where variations in individual stiffness constants can be mapped. d) Need for a faster process of data acquisition. The authors have made significant progress in the simplification of the data acquisition process and the speed of acquisition, with some progress being made in dealing with cross-ply and quasi-isotropic laminates. The inability to measure material density with an NDE tool using access from a single side of a laminate is still considered an unresolved issue and will require further research. The research at Jet Propulsion Laboratory (JPL), California Institute of Technology, was carried out under a contract with National Aeronautics Space Agency (NASA). The authors would like to thank Prof. Ajit Mal from UCLA for his contributions to the analytical capability of inverting stiffness data. Bar-Cohen Y. and D. E. Chimenti, "Leaky Lamb Waves in Fiber-Reinforced Composite Plates," Review of Progress in Quantitative NDE, Vol. 3B, D. O. Thompson and D. E. Chimenti (Eds. ), Plenum Press, New York and London (1984), pp. 1043-1049. Bar-Cohen Y., A. K. Mal and C. -C. Yin, "Ultrasonic Evaluation of Adhesive Bonding," Journal of Adhesion, Vol. 29, No. 1-4, (1989), pp. 257-274. Bar-Cohen Y., and P. Backes, "Open-architecture robotic crawlers for NDE of aircraft structures," Materials Evaluation, Vol. 57, No. 3 (1999) pp.361-366. Bar-Cohen, Y., A. Mal, and S.-S. Lih, "NDE of Composite Materials Using Ultrasonic Oblique Insonification, Materials Evaluation, Vol. 51, No. 11, (1993), pp.1285-1295. Bar-Cohen, Y., et al, "Ultrasonic Testing Applications in Advanced Materials & Processes," Nondestructive Testing Handbook, Section 15 in Vol. 7: Ultrasonic Testing, Section 8, A. Birks and B. Green Jr. (Ed. ), American Society for NDT, Columbus, OH (1991) pp. 514-548. Dayal, V., and V.K. Kinra, J. Acoustic Soc. of Amer., Vol. 89, No. 4 (1991), pp. 1590-1598. Mal, A. K., "Wave Propagation in Layered Composite Laminates under Periodic Surface Loads." Wave Motion, Vol. 10, (1988), PP. 257-166. Mal, A. K., and Y. Bar-Cohen, "Ultrasonic Characterization of Composite Laminates," Proceedings of the Joint ASME and SE meeting, AMD-Vol. 90, A. K. Mal and T.C.T. Ting (Eds. ), ASME, NY, (1988), pp. 1-16. Mal, A. K., C. -C. Yin, and Y. Bar-Cohen, "Ultrasonic NDE of Cracked Composite Laminates," Composites Engineering, Pergamon Press, Vol. 1, No. 2, (1991), pp. 85-101. Nayfeh, A. H., and D. E. Chimenti, "Propagation of Guided-Waves in Fluid-Coupled Plates of Fiber-Reinforced Composite," Journal of the Acoustical Society of America, Vol. 83, No. 5, (May 1988) pp. 1736-1747.